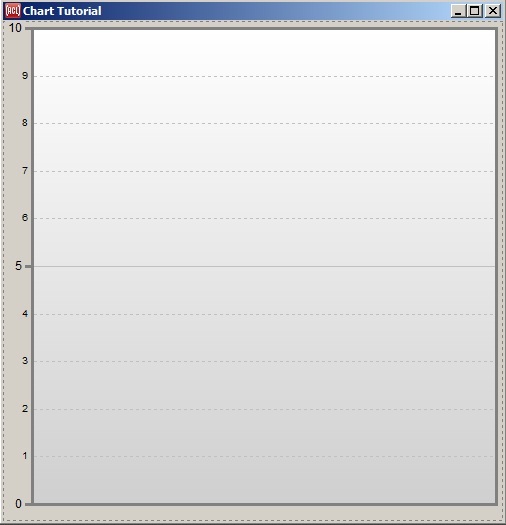 The Chart Widget is a new feature in Allegro CL 8.1. This document provides a tutorial on its use. There is a chart-widget example in the IDE's Navigator Dialog. You may want to try it first to get a feel for the variety of things that the chart-widget can do. Then return to this tutorial to learn how to write chart-widget code from scratch. Once you have displayed the Navigator Dialog (using the Help menu), display the Examples tab and search for chart-widget in the list of examples. Before beginning the actual tutorial, here is a complete example of typical code for creating a chart-widget and giving it some values. This is to give you an overview of the kind of code that is involved. That example specifies the values of various chart properties as initargs to make-instance, which is the typical way to do it. In the tutorial we will usually specify property values by calling accessor functions instead, so you can see them change one at a time. After creating the chart-widget, set-chart-value is called a number of times to add data values to the chart. After looking over that code a bit to get a general feel for it, you can close the chart dialog and proceed with the tutorial, where we will take things one step at a time. In the IDE, a chart-widget can alternately be created interactively by using the chart-widget button on the Components Toolbar to place a chart-widget onto a form window in a project. The button shows two vertical bar-chart bars, one red and one blue. You can then modify the properties in the inspector as with other widgets. We'll reuse this single chart-widget throughout the tutorial, and so we'll bind the global variable *chart-widget* to the tutorial widget to make it easy to modify it with top-level forms. And since we'll be changing the state of this single widget through the tutorial, it's important to evaluate the tutorial code sequentially, since some steps undo a state that was created in the previous step. And don't close the "Chart Tutorial" window until the end. You may want to move and resize the tutorial dialog that you just created so that it's beside this window where you're reading the tutorial. And you might want to watch the chart widget as you evaluate each expression so that you notice each change to the widget. Remember not to close this "Chart Tutorial" dialog until you're done with the tutorial. While the chart-widget has many properties for customizing its appearance, you typically don't need to specify many of them because they have reasonable default values. Above we initially specified only :chart-view :bar to display the data as a bar chart. (The default value is :line, which displays the same data as a line graph instead.) As usual with widget properties, most any chart-widget property can be set up at creation time with an initarg, as in :chart-view :bar, or changed any time later by calling the associated property-setting function, as in (setf (chart-view *chart-widget*) :bar). Without specifying any further properties, we can immediately begin adding values to the chart and see what happens. We do this by calling the main chart-widget function, which is set-chart-value. Let's add an initial value of 12. Adding additional values will continue to use the same range as long as the new values fit within it. But adding a value outside the range will cause the range to be expanded as needed. And of course negative values are no problem. The vertical axis at the left is called the value axis. It always displays a continuous range of values between a minimum value and a maximum. The horizontal axis at the bottom, on the other hand, is called the item axis because it always displays a sequence of discrete items, which have values. The value axis does not have to be the vertical one; the axes can be swapped by setting the chart-orientation property. So it's best to always speak of the value axis and the item axis rather the vertical and horizontal axes. And either axis can increase in the opposite direction via the invert-axis property. Let's give these axes some labels to identify them. While we're at it, let's add titles to the whole chart as well. Normally you'd pass the initargs for these properties when creating the widget, but we're doing things one at a time here. Notice how the body of the chart became smaller to make room for the new labels. The layout is another thing that the widget handles for you automatically, though there are properties for overriding things like the spacing between parts of the chart and the font sizes and so on. It avoids redundant properties between the two kinds of axes, which share almost all of the same properties. There are so many chart properties that dealing with all of them on a single object would be somewhat unwieldy. The complete set of sub-objects is item-axis, value-axis, bar-chart-view, line-graph-view, and chart-legend. If you're editing a chart-widget in the inspector, you will need to click on those sub-object names in the left column to get to their properties. That's not needed with most widgets. So far we've used set-chart-value only to add new bars to our bar graph, but it's more versatile. You can also change the value of existing chart items at any time, for example. The bar labeled "3" looks a little too tall, so let's make it shorter by passing its index along with a new value. The smaller case is less of a problem since no values get clipped off. Typically values don't all shrink by enough to make a smaller range important. (This one especially) it would take much longer to detect the smaller case because all values would need to be checked rather than just the new one, and so it might noticeably slow down calls to set-chart-value. But you can tell the chart to recompute the range at any time by calling update-chart-widget. The value argument specifies the principal value for a chart-item, but there are additional types of values as well. When showing the bar-chart view, the widget can also display a from-value argument by making the bar begin at a different place than the usual "base value". Let's make the fourth bar begin at a non-zero value. Other auxilliary value types include high-value, low-value, and icon-size. Any values that you've added can be turned off by setting them to nil instead of a number. So let's turn those high and low values back off (one at a time this time, to show that they are independent). A set of bars could be used as a set of meters by updating their values repeatedly. Here's a quick example of modifying bars randomly. This example passes the update-now argument to redisplay the chart after every change for an animation effect, rather than letting them all get queued for a single redisplay at the end, as would normally happen. It also calls chart-value to read an existing value in order to modify it incrementatlly. Feel free to evaluate that one again if you didn't catch it well. The item-index argument to set-chart-value can be any non-negative integer to either add a new item or modify an existing one. It can also be the keyword :new to add a new item just after all existing items; that's the default behavior that we saw early on. item-index can also be the keyword :last, to modify the chart item that is currently the "last" one, meaning the one with the highest index. This is particularly useful when adding a series of values for multiple chart "objects", which we'll learn about next. Our chart has several bars so far, but these bars all refer to a single "chart object". A chart object typically represents a real-world thing of some sort, such as a bowler. 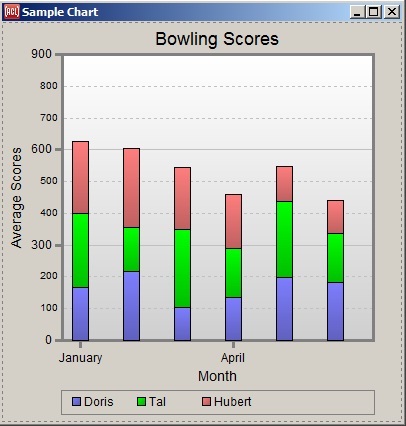 A chart object will have a sequence of values that are displayed in multiple "chart items" along the item axis, such as an average bowling score for each month. The chart-widget can simultaneously display multiple objects by drawing multiple lines across a line graph, or stacked bars or side-by-side bars in a bar graph. Use the object-index argument to set-chart-value to specify the object for the new value. The default value is 0, so you don't need to pass an object-index at all when there is only a single object in the chart. Let's fill in some values for multiple objects to see what that looks like. Now we'll fill in a bunch of monthly bowling scores. This example uses the special :last and :new values of the item-index argument to add values for several chart objects to one chart-item before making a new chart item. That value argument did some fancy footwork to ensure that nobody's average changes by more than 10 points in one month, for a more realistic chart. The incremental nature of each bowler's monthly score change may be more apparent if the bars are stacked vertically instead of resting side-by-side. That also saves space. Or even more apparent if we were looking at a line graph instead of a bar chart. You have probably noticed that a legend box appeared at the bottom of the chart for the first time when we used multiple chart objects. The reason is that the default value of the draw-legend property is :when-multiple-objects, since you typically don't need a legend for a single object. The chart-legend sub-object has various properties to control the layout of the legend. Now this chart isn't particularly meaningful when each chart item and each chart object is labeled with an integer. That's the default behavior, but you can specify any labels that you like for each index. First let's associate a real-world object with each chart object index. Watch the legend as you evaluate this form. The chart-objects property value can be either a vector or a list. Each object's plist within that sequence must be a list, though. The ID for each object is part of a plist because an object can have additional attributes, such as which of two value axes it belongs with (that's covered at the very end of the tutorial). Adding chart object IDs causes the legend to print the IDs rather than their indices. By default the object IDs are printed with princ-to-string. But since people's names are normally capitalized, we should give the legend a printer function that converts the real-world object into a pretty string to display for it in the legend. Watch the legend again as you evaluate this form. We can similarly add meaningful month labels to the chart item tic marks, to replace the default indices. There are two ways to do this. One way is to supply a printer function that converts directly from an item's index to the string to display. If we know that the values we added began at January 2005, then our function can calculate the month and year of each index, and format a string from those two values. Watch the item axis as you evaluate this expression. By default, axis labels will wrap at spaces to save space. You can turn that off by setting the major-label-wrapping and/or minor-label-wrapping properties of the axis object. Note by the way that on Windows labels of horizontal axes can be displayed at an angle: see major-label-angle and minor-label-angle. This second approach would even be necessary if the items are not regularly-spaced values with a simple mapping from their indices to their meanings. Let's say that our bowlers aren't in a league and instead bowl occasionally whenever they get the urge. Let's furthermore pretend that they've already got a record of recent scores stored away in a list like the following. We could use each date list like (2005 dec 12) as the ID of each chart item as we add it to the chart. Then all that the printer function needs to do is convert the date list to a pretty string. Let's undo the current chart values and printer function, and add values from our master *scores* list. This example also passes an object ID instead of an object index. We already set up the object ID's earlier when we set the chart-objects property so that the object ID's would appear in the legend. But those date ID's don't look very nice on the tic marks, so let's add a printer function back on, though this time it can be simpler by acting directly on a meaningful ID rather than on an index. (format nil "~:(~a~) ~a ~a"
When the item-id argument is passed and no item-index argument is, then set-chart-value will try to find an existing chart-item that has that ID. If it finds one, then it modifies that existing chart-item, and otherwise it creates a new chart-item at the end. That's why we only needed to specify item-id and object-id to both create each new item and also to give an existing item additional values for the other chart-objects. A subtle point: it's OK to use a list as an item ID because the default chart-item-id-equality-test is the function equal, which is good for comparing lists. For some types of ID's you may need to change that property (which in the inspector is on the Events tab). If you already have all of your values stored in a readily-accessible place such as an array, then you may want to use an alternative to set-chart-value, which is to supply a chart-value-returner function. This function will get called whenever a chart item is actually drawn (usually due to it being uncovered and/or scrolled into view). Your function should then look up the data value wherever it's already stored and return it. This avoids having the chart-widget code internally cons up a tree of values that you pass individually to set-chart-value. Let's test this out by supplying a chart-value-returner function that looks up the requested value in our *scores* list. The arguments to our function will be the chart-widget itself, the value type (such as :value for the main value, as when calling set-chart-value), the item-index, the object-index, and the object-id. Our *scores* list records value by the object-id, so we'll look them up using that rather than the object-index. Using a chart-value-returner means that we no longer have chart-items with item-id's, and therefore our printer function will once again receive item indices, so we have to replace our tic label printer function again with one that takes indices. First we'll clear the accumulated data in the chart-items property, or else it would override the chart-value-returner function. And now we'll provide a chart-value-returner that will supply the same values lazily when needed, without ever accumulating data in the chart-items property. Since there is no longer an accumulated list of items from which a value range would be automatically computed, we also must set the chart-items-max-index property to tell the widget how many items it should draw. When the value-type argument is :id, we will return the date list that we use as an item ID, and our on-print-major-label function will create a tic label string from that ID. When the value-type argument is :value, we will return the data value for the specified object and item. We can just ignore other value-type arguments since we don't care to display those values. Of course, using an array would be more efficient than a list, but this is just a demo. Even if you have no data on hand, you could still use a chart-value-returner function to graph a mathematical function, for example. The item indices will always be integers beginning at zero, though, so you need to translate those indices into the actual X values of interest. Let's try a sine wave. If the chart-value-returner property remains the same function, but you happen to know that something has changed that will cause the function to return different values, then you can call update-chart-widget to display the new values. That function will uncache data that was computed for the old values, and invalidate the widget so that the new values will be drawn. To cause the new values to be drawn immediately, pass the update-now argument. Here's a variation of the sine wave example that animates the wave in this way. Here the chart-value-returner function closes over a frame variable that is later incremented to cause the chart-value-returner to draw different values each time the chart is redisplayed. Here's a more interesting variation that we won't attempt to explain. Well, that was all jolly good fun. But now to back up and cover some other chart-widget properties. First we need to restore the more boring sine wave. The chart-widget and its sub-objects have many additional properties that determine the final look of the chart. Most of these should be fairly obvious, or easy enough to figure out by playing with them in the inspector. One final matter that may not be so obvious, though, is major and minor tic marks. Both the value axis and the item axis can have major tic marks, tic labels, and grid lines and/or minor ones between successive major ones. The value axis tends to pick out "round" values for these properties for you, but you are likely to want to set these yourself for the item axis where the widget can't know what values would fit your arbitrary chart items. In particular, you may want to set the minor-tics-per-major-tic property of the item-axis. This is always 1 by default, and so all of the tics along the item axis are major ones. If you happen to know that each of your items represent a quarter of a year, then you may want to set minor-tics-per-major-tic to 4 so that there will be a major tic for each year, with three minor tics in between for each quarter. Let's try that with our sine wave, where a minor-tics-per-major-tic of 4 will place a major tic at each 90-degree point. And by turning off minor labels, we will cause the values to be closer together since they don't have to leave room for all those minor labels. Another way to save tic label space is to draw only every N'th label. So we could decide to draw minor labels again, but only every second one. Notice that a minor label will never be drawn on the same item where a major label is drawn (or even where a major tic is drawn). One more interesting property to mention: If your data doesn't fill the entire width of your chart, you may want to make it stretch to fit by turning on the fit-chart-items property. This example will save a chart as a BMP file and then show it in whatever program is registered on your machine to display BMP files. ;; Show the saved pixmap in a third party program. We'll close the tutorial with a couple of standalone examples that don't follow from the sequence above. So feel free to close the Chart Tutorial window at any time now. First an example similar to the one at the top. This will illustrate some of the finer points of major and minor tics and labels. Specifically, we'll show monthly data with three months per minor tic and four quarters per major tic, and offset the major tic labels so that they are drawn in the middle of the years that they represent rather than at the beginning of the years. We recommend that you study the various properties in this code to see how they work together. ;; case is months per quarter. ;; A minor tic for each quarter of the year. ;; mark by half of a major increment. ;; of the set of values for the year. ;; span across multiple minor tic labels. And, finally, an example to show the option for two value axes. Many charts use two value axes with different ranges (and often different units) to plot two lines close together to see how well they correlate. This can be done with the chart-widget by supplying a chart-axis object for the value-axis-2 property, along with the usual one for the value-axis property. The two axes work exactly the same way. So let's see how room temperature affects bowling performance. This code demonstrates a few different ways to tell the viewer which graph lines go with each axis. These include color matching as well as textual notes in the axis labels and legend. :title "Bowling Scores and Room Temperature"
;; value goes with each axis. (format nil "~:(~a~) (~a axis)"
:title "Bowling Scores and Temperature"
;; correlations in each orientation. That's the end of the tutorial. You may want to inspect some charts and play with the properties that weren't covered here. Happy charting!